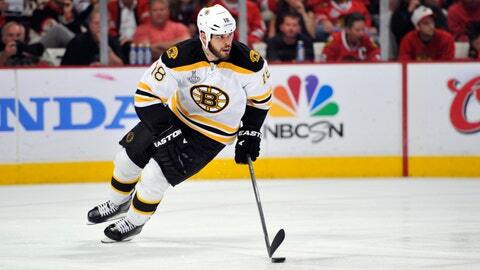 The Blue Jackets signed Nathan Horton in July from the Boston Bruins. By the time you read this story on Christmas day, Nathan Horton and his family will have opened their presents. His teammates will have already scattered to places far and wide to enjoy the three-day Christmas break, mandated in the new Collective Bargaining Agreement as part of the deal that ended the lockout. In previous years, the mandatory holiday break was only two days, which didn’t leave much time for traveling to visit family and friends. Players make sacrifices to play the game that they love, such as missing birthdays and special occasions. This is especially hard on the guys that have young children. "Once I come back, I don’t want to take 20 games to get back (in game shape). I want to do the best I can early and be as ready as possible. I know I’m not going to be perfect, because nothing’s the same, you know? After being off this long, I want to give myself the best chance to be the best I can." Horton, who underwent surgery on his injured left shoulder in July, skated for the first time after the operation on November 7. "They (doctors) told me how long it was going to be (rehab). But actually doing it seems like forever. It seems like it’s so long."
The timeline for his debut in Union Blue was always placed at right around the end of December or the beginning of January. That hasn’t changed, even with the plethora of injuries to the team. "I’m getting closer and feeling better", said Horton. "I can notice a difference every day. Before, it was here and there (feeling good). It stays pretty steady now. I wake up in the morning and I feel better. It feels nice to feel that I’m actually getting better." The perpetual smile that he wears seems even brighter these days. One look at him and you can tell that heâs excited about finally being able to go out and play the game he loves. Heâs at the point where instead of counting the months or weeks until his return, it now seems to be down to days. Last Friday, he skated with the team without having to wear the red "no-contact" jersey. He’s been cleared for contact, although no one is hitting him full bore, yet. "Hopefully, after Christmas I’ll be in an actual practice and start to actually get hit. A couple more days and Iâll feel even better. A little more contact (during practice) will give me a better indication of where Iâm at." Since leaving Boston to sign with Columbus, there have been many Bruins fans that have taken to social media to express their well-wishes to him. He is missed dearly by those fans and they are excited to see that he is close to returning to the game. "Boston fans are great, they’re passionate", Horton said. "They love hockey and they cheer for their team, as well as boo for their team when they’re not doing good. Itâs a loyal fan-base. That’s what makes hockey amazing and that’s what makes Boston a great place to play hockey. They don’t like losing and they love winning. It’s nice for any team to have that." The Midwestern fans that support Columbus are no different in their fervor for the Blue Jackets. They just aren’t quite in your face as much as someone from the Northeast. The buzz that swept through Columbus when Horton signed was palpable. Now that he’s getting close to playing, that buzz is gaining in intensity and he feels it. "It means a lot. That’s part of the reason that I don’t want to come back (too soon). I’m excited to get back and it’s going to be a lot of fun. Once we start winning on a more consistent basis, it will make them more happy, I’m sure." With Horton signed through 2020, he sees the potential of the guys surrounding him on the team. Yes, they are the youngest team in the NHL right now. But, they won’t be that way forever. Not only is he excited about playing now, but as he looks into the future, his smile gets even larger. "Every shift, every game, every year you get more confident", he said. "Hopefully, we can keep our group together, because we are young and weâre talented. We work hard. We have guys like (Matt) Calvert and (Ryan) Johansen, you can see that they’re going to be special players for a long time. It’s only going to keep getting better, I think." "They [CBJ management] have done a great job forming this team. The older we get, the more experience we get in games will only make us better. Weâre going to be good for a long time, not just a year. Year after year we’re going to be in the playoffs and have a chance to win the Stanley Cup." Not only do the guys in the room believe that they are a playoff team, members of the national media that cover hockey are starting to say the same thing. Horton is in his tenth year in the league and has won a Stanley Cup with Boston. Does he think that Columbus is a playoff team as presently constructed? "I think so", he said. "We just canât let our foot off the gas. We play four lines. We play the right way, and that’s hard. When we play the right way and control the game, no one can beat us. We can score, too. We have all the tools. We have every tool in the toolbox. We just have to put them all together. We have to make sure that we work hard and play smart." "We’re going to have a chance to play for the Stanley Cup for a lot of years to come with the talent that we have." Nathan Horton knows a thing or two about winning. He’s got that ring to prove it. He’s excited to show the team and their fans what he can contribute to this team. There’s a buzz in the air. Can you feel it?